The Algonquin Resort, an icon among hotels across Canada, is a leader in the industry when it comes to inclusive hiring and embracing diversity. This approach has had positive impacts in a number of areas, including staff retention, employee engagement and enhancing the guest experience. General Manager, Matthew MacKenzie, leads by example and understands the advantages of retaining good employees and creating a supportive, inclusive environment for his staff to thrive. So it seemed a natural fit to partner with Ready, Willing and Able and expand recruitment to job-seekers with an intellectual disability or Autism Spectrum Disorder (ASD). Through the partnership, the Algonquin Resort has successfully hired individuals for a variety of positions over multiple seasons. With the cost of replacement for new employees estimated to be $3000 and a turnover rate for employees with intellectual disabilities or ASD at a mere 7%, compared to the 49% average across all industries for employees without a disability, hiring job-seekers with an intellectual disability or ASD has a positive impact on a company’s bottom line. 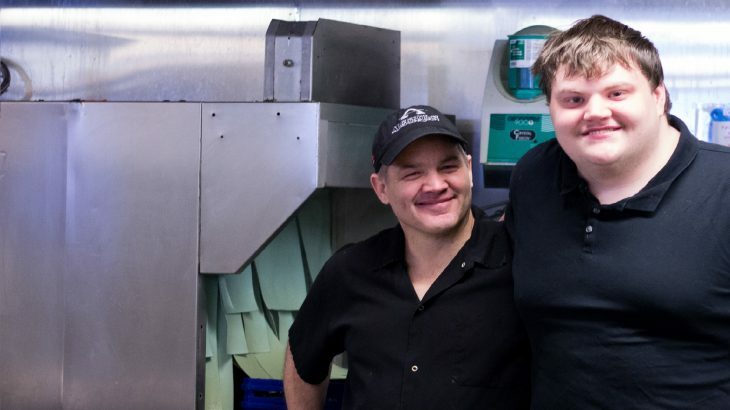 Research data shows 92% of individuals regard companies that hire people with an intellectual disability or ASD more favourably than businesses that have not yet embraced inclusive employment practices. Companies report that employee engagement also increases as diversity is expanded, and team members report that they are proud to be in a workplace that values inclusion and diversity. “Working with RWA has helped us to better determine the right fit for the role and for the Algonquin,” says Erin. Funded by the Government of Canada and active in 20 communities across the county, RWA is a national partnership of the Canadian Association for Community Living (CACL), the Canadian Autism Spectrum Disorder Alliance (CASDA), and their member organizations.